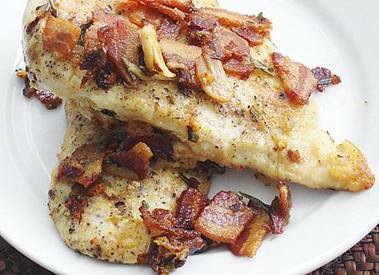 When I made these Chicken Cutlets with Bacon, Rosemary and Lemon for the first time, I expected a quick dinner, but they surprised me. First, you fry the Bacon. Then, you sear the chicken in a little Bacon grease and melted butter. And then, you make a sauce from crispy garlic, fresh rosemary, red pepper flakes, chicken broth, lemon juice and the uber-delicious browned bits scraped from the bottom of the skillet. When the sauce starts to thicken, you put the chicken back into the pan, sprinkle it with a little Bacon confetti, and simmer it until you just can’t stand it anymore – about two minutes. It’ll make you want to stand naked on a ladder in church and shout the good news. Trust me.